This highway runs 25 miles, from the Pennsylvania Turnpike at Valley Forge, through downtown Philadelphia, to the Walt Whitman Bridge. 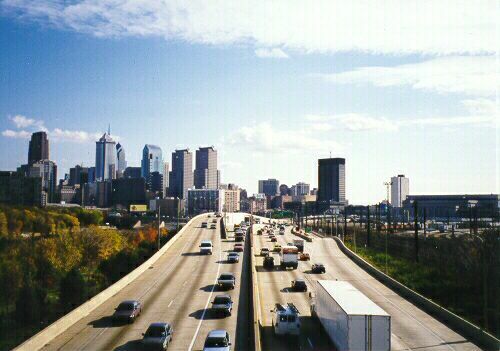 Above, looking south on the Schuylkill Expressway from the Kelly Drive overpass, November 1997. Center City Philadelphia is in the background. The interchange ahead is the junction with the I-676 Vine Street Expressway. The large building on the right edge of the photo is 30th Street Station, the main train station for Philadelphia, served by Amtrak trains and local commuter trains. The Market Street Subway has a station next to the station. 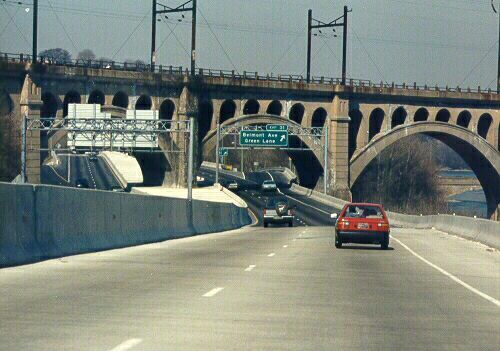 The Schuylkill Expressway was completed in 1959, and the pavement and bridge decks were completely reconstructed in the 1980s (1982 to 1989) at a cost of about $250 million. Above photo by Steve Anderson of New York City, NY. Below photos by Scott Kozel. 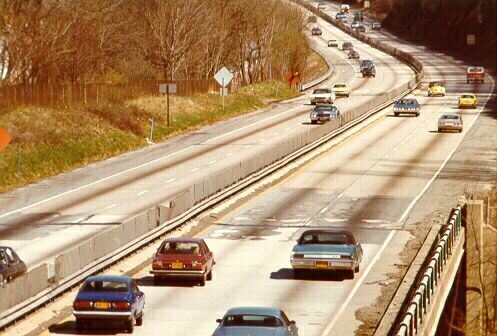 Above, a 1976 photo of the Schuylkill Expressway, looking eastbound from West Conshohocken. The bridge in the foreground takes the Expressway over PA-23 Conshohocken State Road. The highway was considerably deteriorated throughout by this time. Notice the guardrail median barrier with glare screen on top. Above, a March 1987 photo from the same vantage point (lower telephoto). Notice the reconstructed expressway. The concrete pavement was rehabilitated, and a thick hot-mix asphalt overlay placed on top. The bridge decks were replaced. A New Jersey median barrier was installed. Actually, the barrier looks like the F-Shape Barrier profile, which is a close derivative of the New Jersey barrier. In a number of places, concrete barriers were used on the right side of the pavement, as you can see in the distance. Above, Schuylkill Expressway approaching the Belmont Avenue/Green Lane interchange, heading westbound. This is newly reconstructed, like the previous photo, and taken the same day. The bridge on the Expressway is the Pencoyd Viaduct, which is about 1/2 mile long and passes about 100 feet high over a small canyon and railroad tracks. The concrete arch bridge is the railroad bridge for the Manayunk commuter rail line (it was closed later on), which ran from the Paoli commuter rail line to Manayunk. Notice the overhead catenary lines on the railroad bridge. The Schuylkill Expressway needs to be widened, ideally to 8 lanes (4 lanes each way) throughout. I have Xeroxed plan sheets from a PennDOT preliminary engineering study to widen part of the Schuylkill Expressway. These were from a 1975 study, and I copied them from PennDOT when I worked there. The project would have widened the 4-lane (2 lanes each way) highway to 6 lanes (3 lanes each way), between US-1 City Avenue and I-476, a distance of 8 miles, at a cost of $100 million (It was programmed for a few years in the PennDOT 12-Year Improvement Program). Completing that project would have meant that there would be 6 or more lanes on I-76, between I-476 and I-676, a distance of 13 miles. The design would have added a lane each way on the outside of each roadway, keeping the existing median width, installing a Jersey Barrier in the median, and adjusting interchange ramps. Most of it would have involved fairly routine cuts and fills, with some utilization of retaining wall in the large cuts and fills. The one major complication was the Manayunk railroad viaduct near Belmont Avenue (see my previous photo). Rather than reconstruct the railroad viaduct, the highway would have been horizontally "cocked" to reduce the skew between the highway and the railroad viaduct, so that 6 lanes would fit underneath with each directional roadway passing through a span opening. A parallel westbound I-76 Pencoyd Viaduct would have been built on the river side of the existing Pencoyd Viaduct (which would become the eastbound roadway), and some of the piers would have been in the river, and due to the topography, it would have been almost twice as long as the existing highway viaduct, and with piers almost twice as high. Six lanes would have been a big improvement, and still would be a big improvement today. That is the only officially planned widening project for the Schuylkill Expressway that I know of. If PennDOT had built that project, they could have easily extended the 6-lane widening from I-476 to the Pennsylvania Turnpike at King of Prussia. When I developed this article back in 1998, I was planning on eventually developing a far more comprehensive article; but other highway private websites have since then developed comprehensive articles, which follow. I have read extensively about I-76 at various times since the early 1970s, and I can vouch for the accuracy and thoroughness of the historical articles by Steve Anderson and Jeff Kitsko. 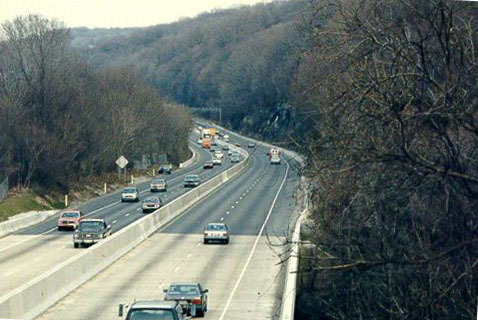 Schuylkill Expressway (I-76) - history by Steve Anderson. I-76 in Pennsylvania - history by Jeff Kitsko. Walt Whitman Bridge (I-76) - history of the bridge which carries I-76 over the Delaware River between Pennsylvania and New Jersey, by Steve Anderson. Copyright © 1998-2003 by Scott Kozel. All rights reserved. Reproduction, reuse, or distribution without permission is prohibited.